Why Hackers Can't take down DNS root servers ? Interpol Chief Ronald Noble on Friday warned that a group of hackers might try to shut down internet service tomorrow. The hacking group, Anonymous, is protesting against several reasons including the crash of Wall Street and irresponsible leaders. There are 13 DNS servers that host the core databases for translating IP addresses. Anonymous hackers have announced "Operation Global Blackout", promising to cause an Internet-wide blackout by disabling the core DNS servers. Anonymous Hackers wants to bombard those 13 servers with traffic using a distributed denial of service attack. If the servers get too overloaded, they’ll crash and therefore be unable to fulfil DNS lookups rendering all domain names useless. There are 13 Root Servers out there, It it not possible to shut down every of them. Even every root server is under control of various companies and they have different hardware and different ways to protect it. If any root server will get down, They can migrate it to other servers. Anonymous Issue the Date i.e 31 march 2012 for there attack, obviously there will be 100's of Security Experts aware about the attack and working at backend for Security and resolving the issues. Internet users don't use Root servers service directly, they are the master servers. Whereas internet users are connected to slave servers , provided by their internet service provider (ISP). Slave servers synchronice there data with root servers (master servers). Root servers are implemented as clusters of hosts using anycast addressing. Anycasting is a tweek to the Internet routing table so that traffic destined for an IP address is redirected to a different local server. Meanwhile, Interpol has launched Operation Unmask to deal with the group and arrested 31 alleged members in two different phases in February and March, 2012. There are around 2.3 billion internet users in the world and more than one million of them are affected by cybercrime every year while $388 billion dollars is the global cost of such crimes. Conclusion : According to us ( The Hacker News) , Hackers strongly not able to shut down the internet. 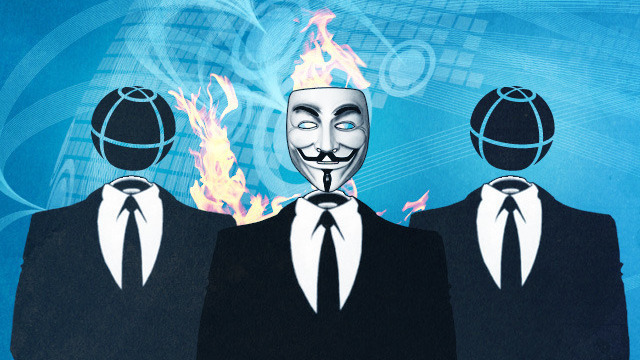 So what do you think , that Anonymous will manage to shut down the web?